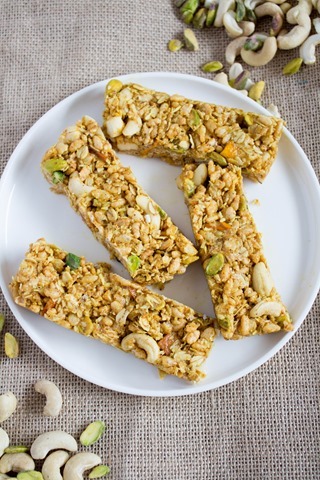 We’re getting into the crazy busy and travel-packed holiday season, so I figure now is the perfect time to share one of my new favorites: this Savory Curry Granola Bar Recipe. It’s no bake and gluten free (if you use gf certified oats and brown rice cereal), too! 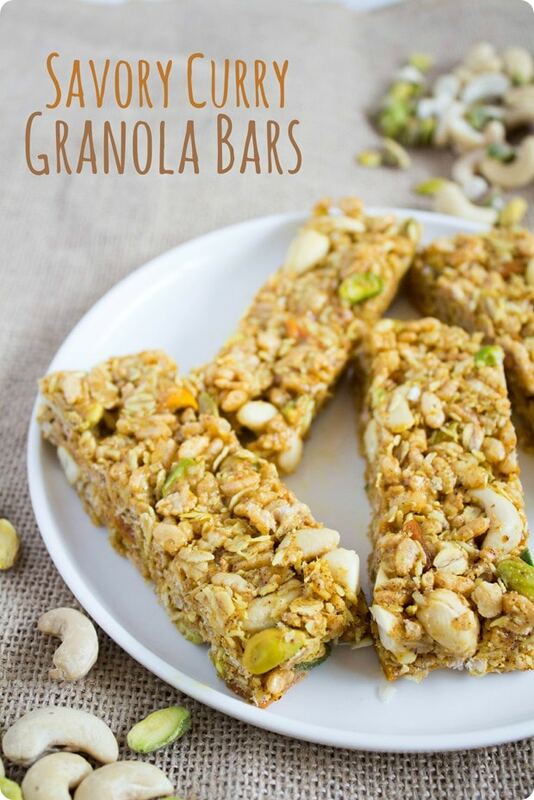 I love granola bars, but I’ve been getting a bit tired of the same old sweet oatmeal/granola bars lately. My savory honey mustard granola bars are a favorite, but it was time to try something new and even more creative. 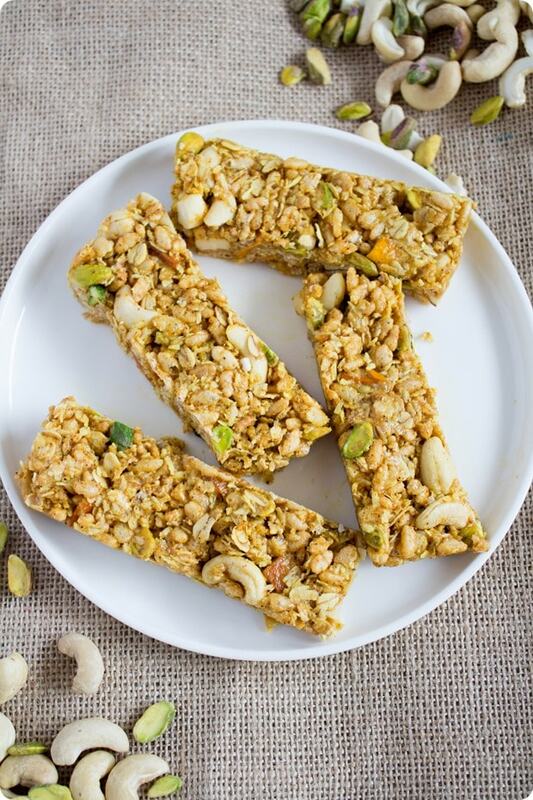 Enter: a curry granola bar! If you’re looking to mix it up too, you’ll love these – so unique and packed with flavor. 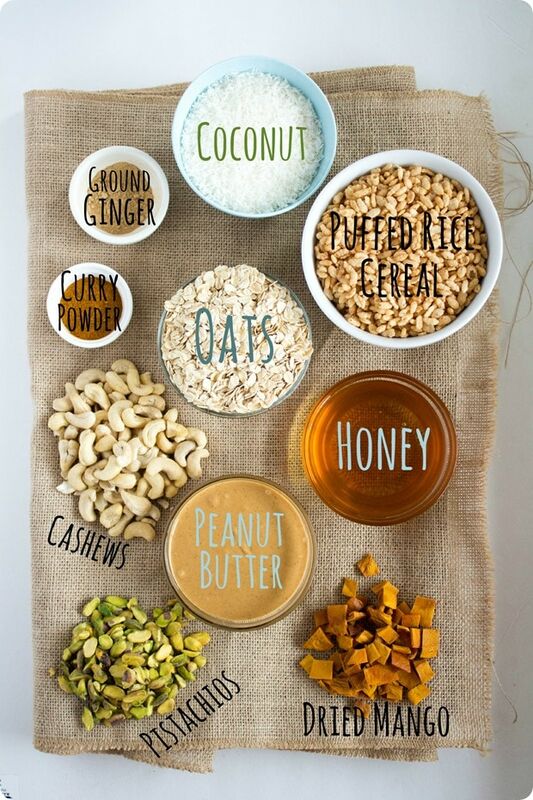 The perfect portable energy bar! Curry powder in a granola bar?! I know, it sounds weird, but I promise it’s really good. The curry pairs perfectly with the rest of the salty and sweet ingredients, like peanut butter, coconut, and dried mango! 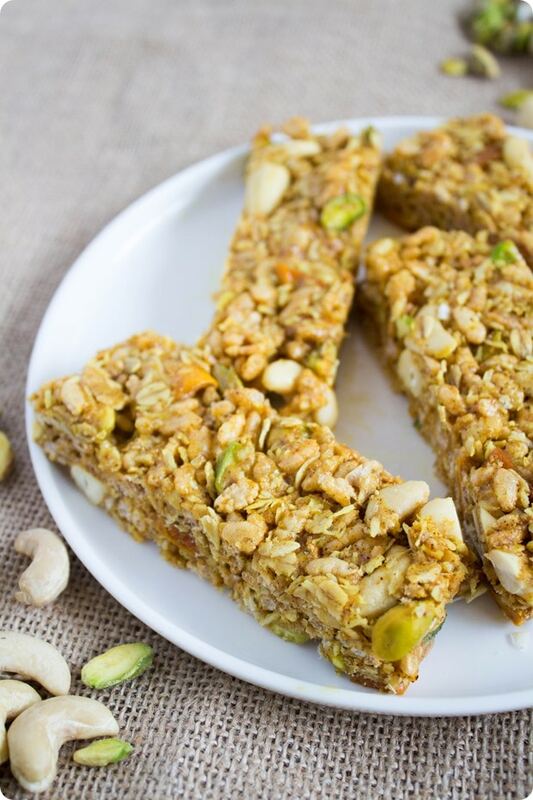 Like many of my other bar recipes, these are no bake (see also the most popular recipe on my blog: 5 Minute No Bake Peanut Butter Granola Bars) and come together quickly. Mix dry and wet ingredients in separate bowls, then combine! Boom. If you’re having trouble getting the PB/honey mixture to blend, you can heat it for about a minute on low in the microwave to soften it up before adding it to the dry ingredients. Then, press into a pan, refrigerate for about an hour to harden them up, and slice into bars! 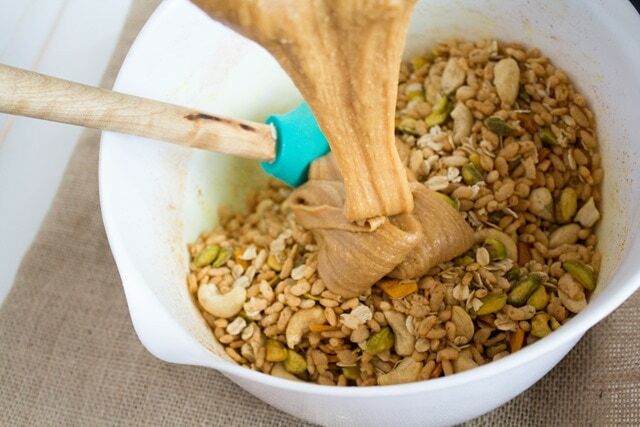 In a large bowl, mix together the cereal, oats, coconut, cashews, pistachios, dried mango, salt, curry powder, ginger, and pepper. 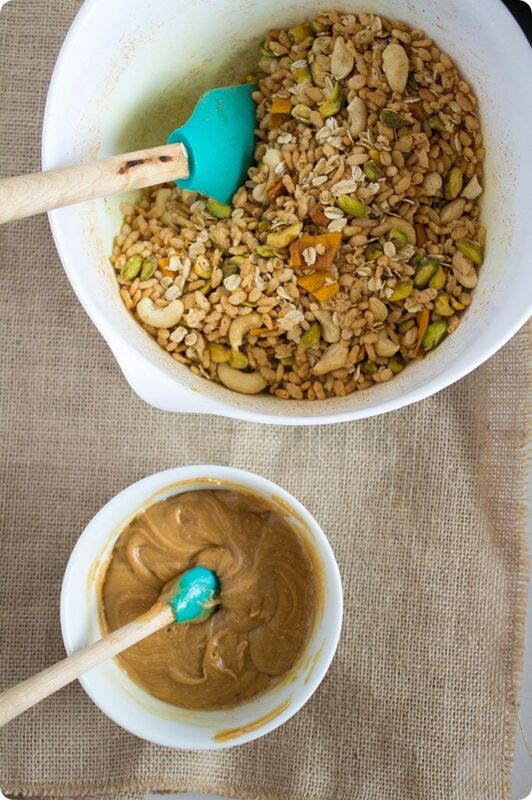 In a separate bowl, stir together the honey and peanut butter. Pack the mixture into a greased 8×8 or 9×13 pan. 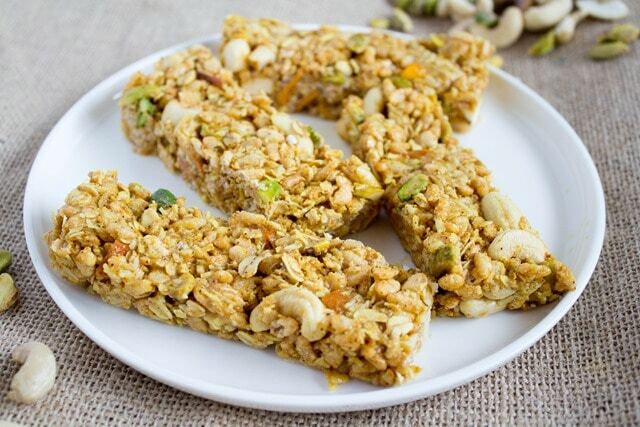 Refrigerate for at least one hour, then cut into bars. Love this! Savory is such a nice change up and I’m always about curry and of course pistachios! I love this. I make a lot of granola bars because I feel like all of the packaged ones are sugar bombs. I have yet to make a savory bar, so I will absolutely try this and let you know what we think. Thanks for sharing! Have a great weekend! I’m super excited to try these out! I’ve been getting tired of the same thing for breakfast and I think these would be a great addition to the usual morning routine. What kind of puffed cereal do you use though? Looks very yummy, thanks! Do they stay together at room temp? Yes, they do — I’d still store them in the fridge, though, so they last longer, and so they harden up before you are ready to eat them. We added only 1/4 cup honey and added more peanut butter instead but it didn’t stick together. Is it because of the less honey? Is there anything else I can do to make it bind better? Is there anything that can be substituted for the coconut?